The ISIAT (International Symposium Intra Articular Treatment) Symposium, that will be held every two years, will move across Europe and will continuously gather most relevant experts on different topics regarding intra-articular access, therapeutic targets and tools and future developments. The ISIAT Symposium will feature lectures by leading experts in order to encourage discussions and stimulating interactions.Furthermore, the ISIAT Symposium will also host a practical course of ultrasound-guided joint injections, applied to all kind of joints. 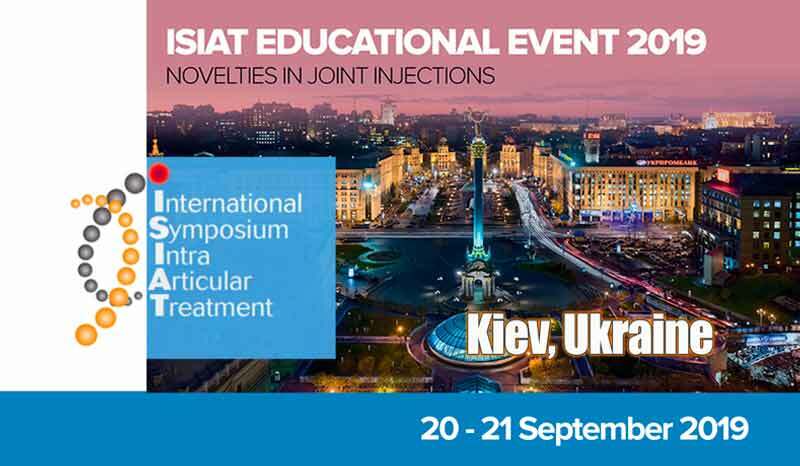 So the ISIAT Symposium also will be a big opportunity for those who want learning or improving their skills in intra-articular injections. The ISIAT Symposium will give an outstanding opportunity to investigators and clinical practitioners to show their latest researches in selected oral presentations or posters. We invite scientists and clinicians interested in intra-articular research and treatment in rheumatology, orthopedics, sport medicine, pain medicine, rehabilitation and interventional radiology to take this opportunity to present and discuss their latest research findings together with other investigators and key opinion leaders. We aim to create a unique, interdisciplinary and stimulating environment focused on developing a wide interchange and improvement of intra-articular management of joint diseases. This ISIAT Symposium is also the chance to develop synergies among different actors of intra-articular world.